I’m not sure how much Fin and I really like that Boom Boom Pow, but we’re quick learners and we know how to “jack the style” of the fifteen middle-aged Moms at the On Stage Dance Academy’s Super Saturday Zumba Fitness Class. Everybody knows the song “Dancing Queen” by ABBA. It is arguably the number one song representing the queer man’s love of grooving. Now, rock ‘n roll, and I will venture to label ABBA’s hit as such, has long been all about the way the political breezes are blowing, and since the song’s release in 1976, the gay community has embraced it. Though purely unintentionally on ABBA’s part, “Dancing Queen” has become more of a political statement regarding busting out of the closet than a mere song about dancing with your prom date. And so, I thought I’d take Fin dancing in my effort to explore our gay pride. Problem: We are barely eighteen years old. We do not own fake IDs. Even if my Jeep could handle the two-and-a-half hour trek to Boston, we would get laughed out of any dance club at which we dared to we show our boyish faces. 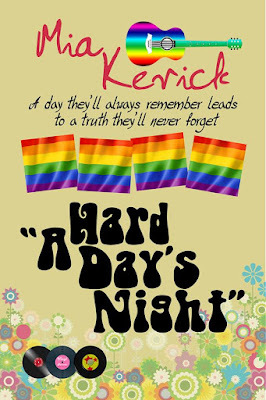 I knew that as part of our gay exploration it was critical that we dance and jive and feel the beat from the tambourine. But where could Fin and I do this both locally, and legally? 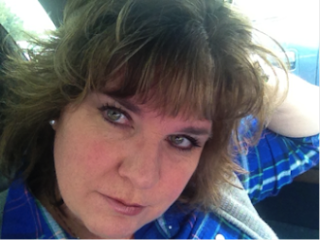 It hit me like a sledge hammer—Zumba Fitness Class! Today's another de-stress day. Between school, work, and life in general, things are hectic and crazy. And I figure that I'm not the only one who might need some stress relief today. I love the Axis of Awesome, they are a great comedy act. These are two songs of theirs that always cheer me up so I hope it does the same for you. The photograph will draw Maggie inexorably into a collision course with criminal forces, decades-long secrets, stolen art and musical artifacts, and deadly terrorists. 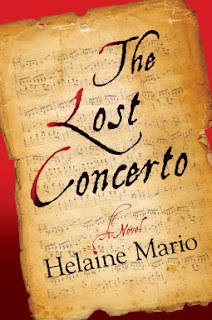 Her search will take her to the Festival de Musique, Aix-en-Provence, France, where she discovers answers to her husband’s death, an unexpected love―and a musical masterpiece lost for decades. Wow…what can I say? 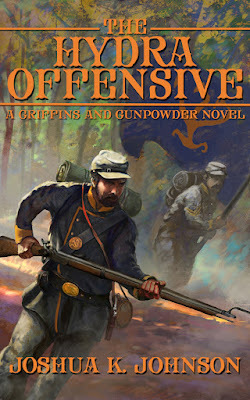 This book was phenomenal. I’ll admit, while I originally thought it sounded interesting, I didn’t think I would like it this much. That last line of the blurb? Sums up this book perfectly. While I had a hard time getting into the story at first, I soon was anxiously reading, wondering what was going to happen next. I was traveling along with Maggie, trying to figure out all the plot twists while connecting on an emotional level as well. The fact that I not only connected with these characters, but connected with them on such an emotional level surprised me. To go from disliking a character to rooting for him, feeling Maggie’s grief and pain like it was my own…yeah, I was very emotionally involved. As for the plot…well, I don’t want to spoil anything, so I’ll just say that while sometimes, I saw some of the twists coming, I was still blindsided by others. The story hardly ever got dull, and I didn’t want to have to put the book down to go to class. While I was expecting a good read, I wasn’t expecting this to be one of my favorite reads of 2015. That being said, I highly recommend you give TLC a try, as it is a marvelous read. You won’t be disappointed. So I keep trying new brands of fish oil, both because I’m asked to and because I’m always looking for the best supplements at the best price. 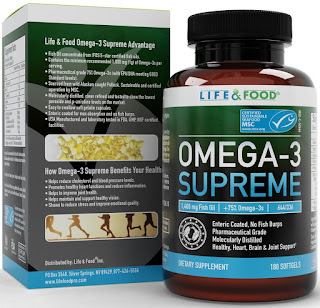 Last month, I was given the opportunity to review Life & Food’s Omega-3 Supreme Fish Oil 1400mg capsules. I planned on writing about the benefit of omega-3s, but then I saw this on Life & Food’s Amazon page and had to share because they summed it up pretty well. - Fish Oil concentrate made from IFOS 5-star certified fish oils. - Sourced from wild Alaskan caught Pollock and a sustainable and certified operation by MSC. - USA manufactured and laboratory tested in FDA, GMP, NSF certified facilities. - Molecularly distilled, clean refined and tested. - Easy to swallow, soft gelatin capsules enteric coated for max absorption and no fish burps. The capsules were easy to swallow, and I didn't have to deal with fishy burps or breath, which was a big relief. However, I wasn't a fan of having to take two capsules a day to get an effective dose instead of one and I wasn't a fan of the fishy smell. The smell of omega oils doesn't usually bother me, but these did. I also noticed that I seemed to experience heartburn more frequently as well while taking these this past month, though I don't know for sure if that was due to these. All in all, these were good omega oil supplements, but I probably won't take them again due to my reaction to taking them. However, I seem to be one of the few who had issues, so I would still recommend looking at other reviews and trying these if they sound like something you'd like. Kidnapped and sold into the Chinese slave trade, the survival of Annette Freder, the wife of University Chancellor Charles Freder, depends on struggling psychic detective, Jackie Vaughn. The one drawback of traditional ice cubes is because the cubes are smaller it require more cubes to keep the temperature down. More cubes with smaller surface area means more melting and less drink in your drink. Having one larger ice cube rather than several small ice cubes means you have more surface area to cool your drink and more heat that is required to melt the cube which means the ice sticks around longer. 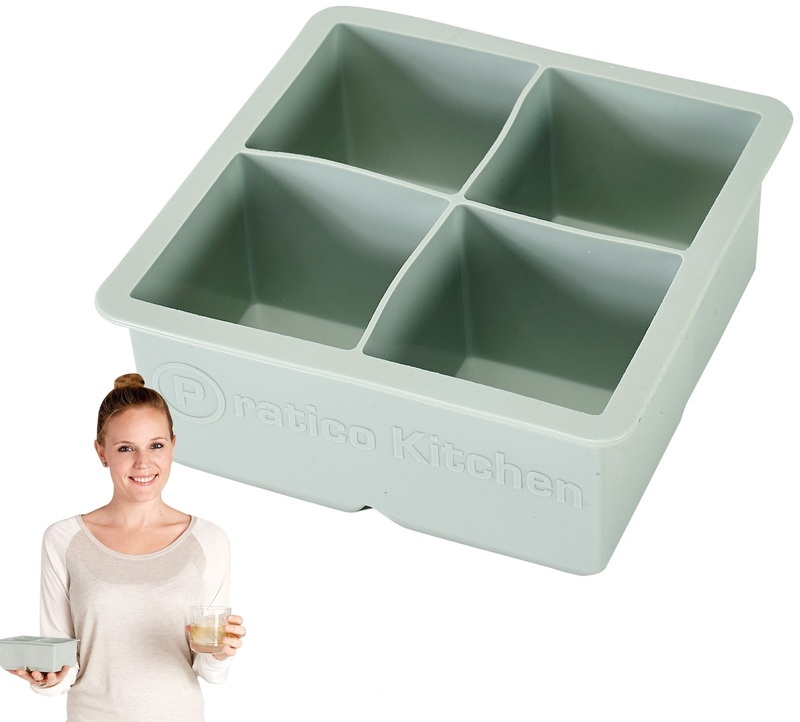 Praticube's custom ice cube tray mold makes 4 extra large (and one of the largest on Amazon) ice cubes at 2.25 inches (most trays top out at 2 inches). Each cube can last up to 4 hours. Because each tray is made from durable, safe, BPA-free silicone, you can use it for all kinds of cubes like coffee cubes, tea cubes, juice cubes, and more. The only limit is your imagination. All Praticube trays are covered by Pratico Kitchen's lifetime no-hassle warranty. If anything happens we will replace it free of charge. I loved using this ice cube mold. I used mine (I only received one, but they now sell them in two packs instead of single packs) not only to create ice for my drinks, but to also make ice pops. Stick a popsicle stick in them, set them in the freezer and wham! Perfect ice pop. I liked using this mold because the cubes were super easy to get out, just had to tap the bottom and they came right out. I only had difficulty removing them once or twice. The mold was also very easy to clean and reuse. I also liked that there wasn't really much of a smell, which I've run into before when buying silicone products. My biggest issue was that these are kind of expensive, especially since you can only make 8 cubes at a time (4 for me). However, they're durable and easy to use, and they're a fun novelty item. I mainly used mine to make ice pops, which my friends loved. So you'll most likely get your money's worth out of these molds. Plus, you can get 20% right now just by ordering them through Amazon. Overall, these were great ice cube molds that I both recommend and will keep using. Since I’ve finally been able to kick my nail biting habit, I now have longer nails. However, years of nail biting has done its damage. My nails are thin and chip or break off easily. I wanted to do something to help repair the damage done to my nails so I started doing my research and came across biotin. Biotin, aka Vitamin B7, is primarily beneficial for your nails, hair, and skin, though there are other health benefits such as increased metabolism and controlling blood sugar levels. For more information, check out WebMD or this article from StyleCraze. So after learning about biotin and consulting with my doctor, I decided to start using it. So when I was given the opportunity to review these, I jumped at it. Nourish your hair, skin and nail from the inside out with Maximum Strength 10,000 MCG Biotin from 100Naturals. 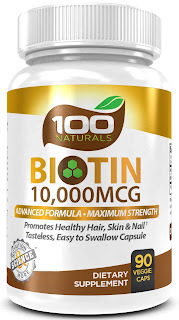 100Naturals Biotin has the maximum strength 10,000 mcg PURE biotin in each capsule. One bottle has 90 vegetable capsules (a 3 month supply) that are easy to take and absorb. They are also made in the USA in FDA registered facilities that are NSF and GMP certified as well as cruelty-free. These capsules were easy to swallow and didn’t have an odor, which I really enjoyed. And after taking these for a month now, I’ve already started to notice a change in my nails. My fingernails not only grow faster, but they seem to be coming in stronger than they used to. I’ve had fewer nails chip or break off and the tips of my fingernails don’t bend as much as they used to when pushed down. However, I’ve also noticed some other benefits. For instance, I’ve noticed that my hair isn’t coming out as much when I shower or brush it as it used to. I have very thick hair, so losing some of it made sense, but now that I’m taking biotin, it’s decreased a bit. Unfortunately, I haven’t really noticed any difference to my skin or my metabolism though, which I was hoping for. However, I’ve only been taking these for a month now, so hopefully, that will change more in the future. My other issue with these were the price. You get a 3 month supply for about $14, which isn’t bad, but there are cheaper alternatives available. However, while the cheaper alternatives contain the same amount of biotin, they also contain calcium as calcium carbonate, which doesn’t seem like it would make that big of a difference unless you were allergic to it or had high blood calcium levels. However, that would be up to you to decide whether you wanted to pay more for pure biotin or less for a mix with calcium carbonate added in. Overall, these definitely show promise, and I will continue taking them to see if they keep working and improving my nail health (among other things). Yes, I realize that today is Tuesday, not Wednesday. This was originally going to be last week's WW post. 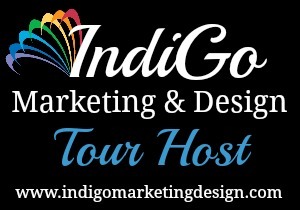 However, I ended up being asked to host two tours on Wednesday, so I decided not to post this then. I was going to push it back to this week, but when I looked back on past weeks, I realized just how bad I've been about posting for WW. So, I decided to do a double Wellness Wednesday post this week instead of postponing again. I decided to do a post on garcinia cambogia because I've been hearing a lot about it lately. Jonah Hill credited his drastic weight loss a few years ago to using garcinia cambogia, and he's not the only one. So many celebrities and health gurus have been talking about it. 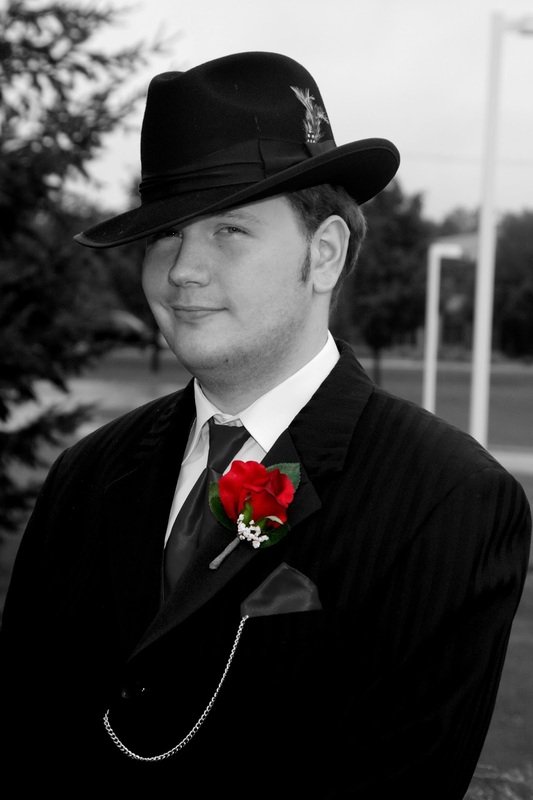 Now, I've struggled with my weight for most of my adult life. While I realize that I will never be skinny and am okay with that, I do want to be healthy. And part of being healthy is getting back in shape and losing some of my extra weight (no joke...doctor's orders). 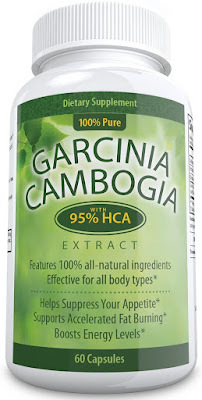 I've already started exercising more and eating healthier, but I wanted to see if using garcinia cambogia would help. I tried it in the past, but didn't really see drastic results. In fact, I couldn't even tell if the results I was getting was due to the garcinia or just due to the lifestyle changes I'd made. Take advantage of what experts call a revolutionary breakthrough in weight loss! Rather than risking your health with products that contain dangerous stimulants, our 100% natural Garcinia (with 75% more HCA than most competitors) is your answer! No jitters, no upset stomach, no side effects. Heard about other Garcinia not working - They aren't formulated properly! We have the absolute HIGHEST, MOST POTENT, DOSAGE OF HCA AVAILABLE ANYWHERE, so you may notice a difference faster and see more weight lost. Get the MOST for your money! Plus, our Garcinia is 3rd party lab tested, so you know what you're really getting! If you tried other products but didn't see results...you NEED to try ours! Pinnacle Nutrition's products are all covered by a LIFETIME Manufacturer's 100% money-back guarantee. The company claims in their description that there are no side effects, but I had several that could potentially be linked to these. Along with the raised blood pressure and heart rate, I found myself feeling nauseous often while taking these. I started expecting to become nauseous while taking these, which is never a good sign. And once I stopped taking them, I noticed that I wasn't experiencing nausea anywhere near as often as I had been. The only reason I gave this a two star instead of a one star is because I couldn't link the symptoms I was having to the garcinia. While I did notice an increase in symptoms, I continued having them after I stopped taking the garcinia. So, I don't know if the capsules were to blame or not, but I won't be using them again, and I wouldn't really recommend these. However, this is just my experience. If you look on Amazon, they've gotten lots of great reviews, so I could have just been one of the anomalies. Nevertheless, I won't be using these again nor would I recommend them.